Learn practical, field-tested strategies that will help you put the Health back in healthcare! 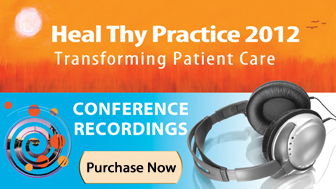 This course features lectures from the popular Heal Thy Practice-Transforming Patient Care 2013 conference held in Long Beach, CA. Heal Thy Practice offers equal measures of clinical skill-building, nuts & bolts practice development, and inspiration from some of the pioneers and key opinion leaders in holistic/integrative medicine. The presentations address some of the key challenges in building and sustaining a thriving holistic/integrative medical practice. Whether you’re contemplating a major practice change or simply looking for practical advice for improving the fiscal health of your practice and the physical health of your patients, you’ll find a wealth of valuable guidance from Heal Thy Practice 2013. Our renowned faculty offers you their real world, field-tested experience and practical steps for creating and maintaining a healthy and health-focused integrative practice. Heal Thy Practice, produced by Holistic Primary Care, is the nation’s leading conference dedicated to practice transformation & the implementation of integrative care. The 2013 program in Long Beach, CA offered equal measures of clinical skill-building, nuts & bolts practice development, and inspiration from some of the pioneers and key opinion leaders in holistic/integrative medicine. Dr. Gladd graduated from Indiana University School of Medicine in 2001. After completing his residency, he started a family practice in Columbia City, IN. After the birth of his second child, he transformed his professional and personal focus toward health through nutrition. He completed the University of Arizona Integrative Medicine fellowship program under Dr. Andrew Weil, MD at the end of 2009. While in the fellowship, he served as the medical director of the Parkview Center for Integrative Medicine in Fort Wayne, and in 2010 opened GladdMD Integrative Medicine where he blends health-promoting care with high access technology. , a website to house professionally authored patient education content. Dr. Gladd attended the first Heal Thy Practice conference in Tucson, AZ in 2009. Board certified in Naturopathic Medicine, Dr. Beaudoin practices in Bedford, NH, and Groton, MA. She received her medical education at Bastyr University. She is passionate about creating healing partnerships with her patients as she guides them toward their individual health and wellness goals. Dr. Beaudoin maintains a broad family practice and has many interests in clinical medicine including heavy metal chelation therapy and environment detoxification. Dr. Beaudoin is also interested in holistic mental health and has a subspecialty practice for patients with depression, anxiety and ADHD. She serves as a medical educator for Emerson Ecologics. Working alongside a uniquely qualified team, Dr. Dominguez not only provides a superior level of healthcare for her private practice patients but also serves on staff at Mission Hospital Regional Medical Center. Dr. Dominguez completed her BS in Kinesiology at UCLA, obtained her MD from UC San Diego, then completed her Family Medicine Residency at Long Beach Memorial Medical Center. As a resident, her passion for mothers and infants inspired her to complete additional training in Maternity Care. She received the Mead Johnson Leadership Award, which annually recognizes a select group of 15 residents nationwide for their leadership and community involvement. From 1999 to 2006, Dr. Dominguez built a thriving group practice at St. Jude Heritage Health Foundation in Diamond Bar, California which further prepared her for opening her private practice, Complete Care Family Medicine, in July 2006. Today, Dr. Dominguez is one of a handful of doctors in the country who is an “expert” in combining western and alternative therapies to provide state of- the-art bioidentical hormone replacement, functional medicine, nutrition, and herbal therapy in a highly-customized, complementary, and integrated protocol. Mette Dyhrberg, M.Sc. (Economics) Aarhus School of Business and UCLA. Thomas Blomseth Christiansen, M.Sc. (Internet Technology), The IT University of Copenhagen. Through her own illness, Mette discovered the need for a drastic improvement of the current health care system. She co-founded Mymee with Thomas Christiansen, who had been using systems thinking & software engineering methods to improve his allergies. Unsatisfied with conventional health care, they took process improvement methods from business & industry and started applying them to improving their own health conditions. Together they’re now incorporating the lessons learned from that undertaking into Mymee, a technology platform that empowers practitioners to uncover hidden causes of health problems. Michael Gaeta, DAc, MS, CDN, is a visionary educator, clinician, writer and publisher in the field of natural healthcare. He offers trainings, patient care and learning programs to create a world of resilient, vital people who make a difference through positive contribution. Michael earned his Master’s in acupuncture from the New York College of Health Professions where he was a faculty member for 10 years. He is also a Certified Instructor and former state representative of the American Organization for Bodywork Therapies of Asia. In 1990, Michael founded the Hands-On Health Wholistic Centers. Now practicing through Gaeta Acupuncture and Nutrition (in Forest Hills and Huntington, NY, and Boulder, CO), he combines clinical nutrition, acupuncture, herbal therapy and Asian bodywork to help people heal, grow and evolve. He co-founded Acupuncture for Veterans, which provides free and low-cost treatment to US veterans. In addition to teaching clinical skills, Dr. Gaeta also lectures nationally on business strategy for health professionals through his Success with Natural Medicine and Love, Serve & Succeed® seminars. A medical journalist with nearly 30 years’ experience, Erik Goldman is the founder and editor of Holistic Primary Care-News for Health & Healing, the nation’s leading publication about holistic medicine for clinicians. He is also the co-producer of the Heal Thy Practice conferences & the Holistic Education Exchange website. Goldman studied biology & philosophy at the State University of New York in Binghamton. Prior to starting Holistic Primary Care, he was the New York Bureau Chief for International Medical News Group, and also worked as a medical textbook editor for Gower Medical Publishing. HPC launched in October 2000. David Hykes is a pioneering composer, singer, teacher of contemplative music and mindfulness, and media artist. He directs the Harmonic Presence Foundation, which since 1981 has explored resonant relationships between mind, music, meditation and medicine. Combining elements from Indian, Mongolian, Judeo-Christian and Islamic chant traditions, Hykes’ innovative overtone chant technique is world-renowned. His widely acclaimed album, Hearing Solar Winds, recorded with his Harmonic Choir, has sold over 300,000 copies worldwide, making it the best selling “throat-singing” album in history. Hykes gives concerts, seminars, and master classes, and leads contemplative music & meditation retreats in countries around the world. Richard Jaffe is a health care litigator and counselor with a primary focus on cutting-edge medical/legal issues. He represents practitioners, companies and health related organizations in complex health care matters throughout the US, and specializes in legal cases brought by federal and state government agencies. He has extensive experience in Medicare and insurance fraud defense, FDA litigation, professional licensure and criminal and civil scheduled drug prescribing problems. He also has represented doctors and companies on matters involving nutritional supplements. John La Puma MD is a practicing internist in Santa Barbara, CA. He is also a professionally trained chef, author, and television personality dedicated to changing the way people think about food, health and medicine. Three of his books–Cooking the RealAge Way, The RealAge Diet and ChefMD’s Big Book of Culinary Medicine–have been bestsellers around the world and have been translated into 8 languages. His new book, REFUEL, to be released at the end of this year aims to change how men think about what they eat–as fuel too, and as a way to stop converting testosterone into estrogen. Dr. La Puma did his residency in internal medicine at West Los Angeles VA Medical Center and UCLA, and completed the first postgraduate fellowship in general internal medicine and clinical medical ethics in the US, at the University of Chicago. He became a Clinical Associate Professor of Medicine at the University of Chicago, Professor of Nutrition at Kendall College’s School of Culinary Arts, and cook at Chef Rick Bayless’ Topolobampo in Chicago. Dr. La Puma graduated with honors from the Cooking and Hospitality Institute of Chicago (now a Le Cordon Bleu school) in Professional Cooking. He taught the first Nutrition and Cooking course for medical students in the US, at SUNY-Upstate with Dr. Michael Roizen of the Cleveland Clinic. Dr. Larson is the director of a private clinical practice based in Encinitas, CA, that focuses on helping people with overlooked and challenging health conditions. He earned a Doctor of Chiropractic degree from Southern California University of Health Sciences (Los Angeles College of Chiropractic), graduating with honors. He is a Certified Clinical Nutritionist by the Clinical Nutrition Certification Board and is a member of the Institute for Functional Medicine, the International and American Association of Clinical Nutritionists, and the American Chiropractic Association. Dr. Martin is among a vanguard of young physicians creating direct-pay practices to support of a holistic approach to patient care. Her TrueMed Institute, in Hood River, OR, is an independent clinic that empowers patients toward true wellness. Dr. Martin’s journey was chronicled in the award-winning film, Escape Fire: The Fight to Rescue American Healthcare. Dr. Martin attended medical school at Nova Southeastern University College of Osteopathic Medicine in Fort Lauderdale, FL, where she also received a Masters in Public Health. She completed a residency in Family and Preventive Medicine at the University of Utah before returning to her native Oregon where she practiced in a variety of settings including a community health center, private practice, urgent care, and emergency medicine. She is a fellow of the University of Arizona Program in Integrative Medicine. Dr. Masley is a board-certified physician, nutritionist, longevity researcher and award-winning patient educator. He received his MD from the University of Washington in Seattle. He then trained in Family & Community Medicine at the University of Arizona, Tucson. He’s a fellow of the American College of Nutrition, and a certified acupuncturist. Before starting his own clinic, he was Medical Director at the Pritikin Longevity Center® and at St. Anthony’s Carillon Executive Health. Dr. Masley is also an acclaimed chef, whose cooking experience includes an internship at the Four Seasons Seattle, and recipe consulting work with Bone Fish Grille. Over the past two decades, through his “Ten Years Younger” programs, he has helped thousands of patients get fit & reverse Type 2 diabetes and cardiovascular disease. He’s the author of three popular books. His fourth, The 30 Day Heart Tune-Up, will be published later this year. 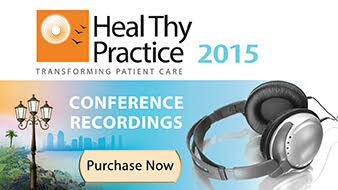 Dr. Masley was the Conference Chairman for Heal Thy Practice 2011, and 2012. NES Health is a UK based company dedicated to fostering a 21st-century system of healthcare based on the integration of physics and biology. As part of NES Health, Harry invented two health-related clinical technologies: the NES miHealth and NES Provision. His passion for changing the face of healthcare arose from his own health challenge as he sought to overcome a serious illness in his youth. Harry is also a filmmaker, having served as producer and co-writer of the 2009 best-selling documentary DVD, The Living Matrix: A New Science of Healing, which championed the rise of a new kind of medicine based on energy and information fields. More recently he directed the full-length documentary film, Choice Point, and wrote the accompanying book that aims to inspire people to transform themselves and to develop paradigm-changing technology that can assist us in solving some of the world’s most pressing problems. Dr. Minich holds a PhD from the University of Groningen, Netherlands (Dissertation Title: Essential Fatty Acid Absorption and Metabolism) and Master’s Degree (M.S.) from the University of Illinois at Chicago. She has had further training and certification through the American College of Nutrition (Certified Nutrition Specialist and Fellow) and the Institute of Functional Medicine. In conjunction with her academic training, she has had a variety of spiritual mentors to learn Shamanic healing practices, Reiki, (medical) intuitive assessment, and is a Registered Yoga Teacher (RYT) with a foundation of more than 20 years of yoga practice. She served for many years as Vice-President for Medical Affairs at Metagenics. Currently, Dr. Minich is VP of Education at the Personalized Lifestyle Medicine Institute, working closely with founder, Jeff Bland, to foster evolution of the lifestyle-based healthcare. Originally from the UK, Mr. Maskell has been involved in holistic medicine almost since birth. His first chiropractic adjustment was at 15 minutes old, and he consistently responded well to homeopathy during his childhood. At the University of Nottingham, James studied Economics with a focus on the food and healthcare industries, and began his career in investment banking. However, his time in banking showed him an important fact: world focus on short-term gain in the healthcare and food industries, were costing society in the long run. In 2005, James moved to the US, with the objective of working to help shift the health paradigm of the country to incorporate true primary care . . . nutrition, exercise, prevention and holistic therapies. Since 2007, he and his wife, Rachel, have been helping to help practitioners grow and develop their holistic practices through a partnership with Energetix, a bio-energetic remedy and education company based in Georgia, and through Revive Primary Care, their independent marketing consultancy based in Brooklyn, NY. David Perlmutter, MD, FACN, ABIHM is a Board-Certified Neurologist and Fellow of the American College of Nutrition who received his MD from the University of Miami School of Medicine. After completing residency training in Neurology, also at the University of Miami, Dr. Perlmutter entered private practice in Naples, Florida where he serves as Medical Director of the Perlmutter Health Center and the Perlmutter Hyperbaric Center. Dr. Perlmutter serves as Adjunct Instructor at the Institute for Functional Medicine in Gig Harbor, WA. He is recognized internationally as a leader in the field of nutritional influences in neurological disorders. He is the author of: BrainRecovery.com – Powerful Therapy for Challenging Brain Disorders, The Better Brain Book (Putnam Publishers), Raise a Smarter Child By Kindergarten (Morgan Road Books), and Power Up Your Brain – The Neuroscience of Enlightenment (Hay House Publishers). His new book, Grain Brain: The Surprising Truth About Wheat, Carbs and Sugar—Your Brain’s Silent Killers, has roused considerable discussion among consumers and clinicians alike, reaching the New York Times’ bestseller list within the first week of its publication. Shilpa P. Saxena, MD is a Board-Certified Family Physician with over 15 years of progressive patient care at SevaMed Institute, her successful functional medicine practice in Lutz, FL. Dr. Saxena is a Fellow & Guest Faculty of the Arizona Center for Integrative Medicine; a faculty member of the Institute for Functional Medicine, and Volunteer Assistant Professor of Family Medicine and Community Health at the University of Miami Miller School of Medicine. She is an expert in the Group Visit medical model and enjoys bringing unique solutions to audiences in her classic 'keep it simple' style. She speaks internationally to encourage and inspire both physicians and patients to regain the power to activate a transformation towards well-being. Dr. Saxena graduated from the University of Florida College of Medicine. She served as Chief Resident and received additional Certification in Low Risk Obstetrics. A firm believer that food is the best medicine, she is co-author of a new book called The Ingredients Matter: India, the first in a series aimed at helping people improve their health along with their culinary artistry. Based in Del Mar, CA, Miriam Zacharias is a speaker, author and consultant to the wellness community. Her mission is to empower individuals and organizations to profitably bring the message of natural health to their communities. She teaches clients how to enhance their personal and business performance to create the best possible outcomes for their patients and themselves. After 25 years as a corporate sales, marketing and operations director – the last 10 of those at Microsoft Corporation, Miriam studied Holistic Nutrition, trained to be an executive coach, and became certified as a corporate coach trainer. She is also licensed in sports nutrition, and has authored a how-to book on the triathlon lifestyle. With her colleague, tech consultant Julia Zaslow, Miriam started “Z School,” dedicated to teaching healthcare professionals and other small business owners the ins and outs of internet-based marketing. Enhance clinical skills by incorporating individualized, evidence-based nutrition & lifestyle change strategies to improve outcomes for patients at risk for cardiovascular disease, diabetes, chronic inflammatory conditions & other common disorders. Improve the care of "difficult" patients with complex chronic disorders. Understand strengths and drawbacks of various practice models for prevention-oriented medicine, including standard insurance-based practice; fee-for-service; concierge care, functional medicine. Make better use of video, social media & online marketing tools as well as traditional marketing strategies for practice-building. Apply practical "nuts & bolts" entrepreneurial & management skills. Acquire a firm grasp of the medicolegal aspects of holistic/integrative practice. Renew enthusiasm for clinical practice. The Heal Thy Practice 2013 lectures are intended for primary care medical doctors, (MDs), doctors ofosteopathy (DOs), broad-scope chiropractors (DCs), naturopathic physicians (NDs/NMDs), nurses, nutrition counselors, medical students, office administrators, and other health care professionals interested in improving the business aspects of their practice through prevention-focused, patient-centered medicine. Deanna Minich, PhD, is a consultant for the Institute of Functional Medicine, the Personalized Lifestyle Medicine Institute, and Metagenics, Inc.
HPC's recent survey of 2,000 primary care physicians shows a major shift toward holistic & functional medicine, with a near-tripling of the number using nutraceuticals in their practices. Many doctors are considering major changes in their practice models, and seeking new revenue streams. Diminished insurance reimbursement, time pressure, uncertainty about reform & rising patient demand are driving the shifts. Gain perspective on the rapid changes in today's primary care landscape. For many clinicians, fear of failure is a big obstacle to change. Drawing from his own experience creating a successful independent, noninsurance practice, Dr. Gladd offers reality-checks for common fears & practical steps for overcoming them. The functional medicine model offers a systems-oriented approach to patient care that engages both patient and practitioner in a therapeutic partnership that facilitates individualized approaches to underlying causes of illness. Based on 6 core principles, functional medicine offers a comprehensive framework for improving the lives of people with common chronic diseases. Dr. Saxena, a family physician, shows how she built her thriving practice on a strong functional medicine foundation. The group visit model—in which physicians see multiple patients struggling with the same health challenges at the same time—has gained traction in recent years. Dr. Saxena, shares the nuts & bolts details on how she successfully incorporates group visits into her highly successful functional medicine practice in Lutz, FL. Many medical professionals avoid thinking about finances, preferring to focus on the art of healing. This avoidance can have dire consequences. Drawing parallels between the health of a medical practice and the health of the people it serves, Dr. Gaeta, a practicing acupuncturist & practice development consultant in Boulder, CO, offers practical tips & insight on how to improve your fiscal health & wellbeing. Amid all the hype, it is challenging to discern what really works for safe & lasting weight-loss. Dr. Masley, Heal Thy Practice chairman emeritus, reviews the science behind the strategies he’s found most effective in helping his patients lose weight. He also offers practical tips on bringing good weight-loss programs into a busy practice. Inflammation has a pivotal role in neurological disorders like vascular dementia, Parkinson’s, Alzheimer’s, MS, and ADHD. Learn about modifiable factors in the inflammatory cascade, the neuropathological effects of gluten sensitivity, and the role of specific nutrients in reducing protein glycation. Dr. Perlmutter directs Perlmutter Health Center in Naples, FL. His latest book, Grain Brain, explores the potential neurologic harm caused by grain-based diets. insurance medicine. The concierge model provides a setting for more focused patient care, less time pressure, and a deeper therapeutic alliance, which can be highly satisfying to patients and practitioners alike. But it is not without challenges. Dr. Dominguez, founder of Complete Care Family Medicine, Mission Viejo, CA, shares tips she learned in the process of making the transition to a concierge model. After years of frustration in a range of conventional settings, Dr. Martin set out on her own to create TrueMed Institute, an independent direct-pay clinic that focuses on nutrition-based strategies that empowers patients toward true wellness. In this lecture, Dr. Martin, who was featured in the award-winning film, Escape Fire: The Fight to Rescue American Healthcare, shares valuable lessons she learned during the process of creating her own clinic. Rick Jaffe is one of a handful of attorneys in the US who focus specifically on medicolegal issues in holistic & integrative medicine. Trained at Columbia University School of Law, he has represented some of alternative medicine’s pioneers, including Stanislaw Burzynski and Emanuel Revici.In his lively, pull-no-punches style, Jaffe reviews perspective on federal and state regulations affecting holistic practice, and offers tips for keeping your practice on safe legal ground. Recognition of biological individuality is driving a major shift in medicine, as researchers & clinicians recognize the limitations of “one-size-fits-all” treatment. The advent of new, relatively inexpensive testing methods has brought genomic testing to the consumer market, a trend that promises great opportunities for holistic clinicians. Dr. Minich, VP of Education at the Personalized Lifestyle Medicine Institute, offers insight on how to take advantage of the nutrigenomics revolution to improve clinical outcomes & strengthen your practice. Nearly 90% of US adults use the Internet to find a practitioner. Yet, many clinicians have difficulty creating an effective online presence. Popular marketing consultant, Miriam Zacharias, returns to Heal Thy Practice with, The PEACE Process, a comprehensive framework specifically designed for integrative practitioners, enabling them to create value based on their values. Miriam is CEO of Competitive Fitness Group & teaches marketing at Maryland University of Integrative Health. Creating educational & entertaining videos for your patients can save you a LOT of time and energy in the clinic. HTP’s new-media maven returns this year with tips for making fun and effective videos & disseminating them to your patients. Mr. Maskell is CEO of Revive Primary Care, a NYC based digital marketing strategy company for holistic health professionals. The current obesity “epidemic” is largely being driven by overweight men. Males in midlife face a number of health challenges – weight gain, diminished testosterone, marked increases in cardiovascular risk, among others. Yet most men are much less proactive about prevention than women. In this lively lecture, internist/Chef John La Puma, MD shares the strategies he’s found most effective for engaging men in meaningful lifestyle change.